With an enviable position above Porthallow, this beautiful farmhouse stands about half a mile up the hill from the enchanting, traditional Cornish seaside village of Porthallow. Sympathetically refurbished to provide superb accommodation for up to 11 guests plus a cot, this old farmhouse is superbly equipped and has views across the wild Lizard landscape to Falmouth Bay beyond. Its warm colour schemes give a relaxed, informal feel, the huge kitchen/dining-room with its cosy wood-burner being the focal point of the house. There are two flagstone-floored sitting-rooms, one with another wood-burner set inside the original stone inglenook fireplace. Upstairs the bedrooms are all light and spacious. The two front bedrooms have fabulous sea views and the family bathroom includes a luxurious jacuzzi bath and the fourth bedroom has versatile 'zip and link' beds and an additional single bed. The wheelchair accessible annexe offers a further bedroom with either a super king bed or two single beds and en suite wet-room, ideal for single level living. Outside there is a games-room, hot tub and gardens. Roskorwell Manor offers something for guests of all ages. 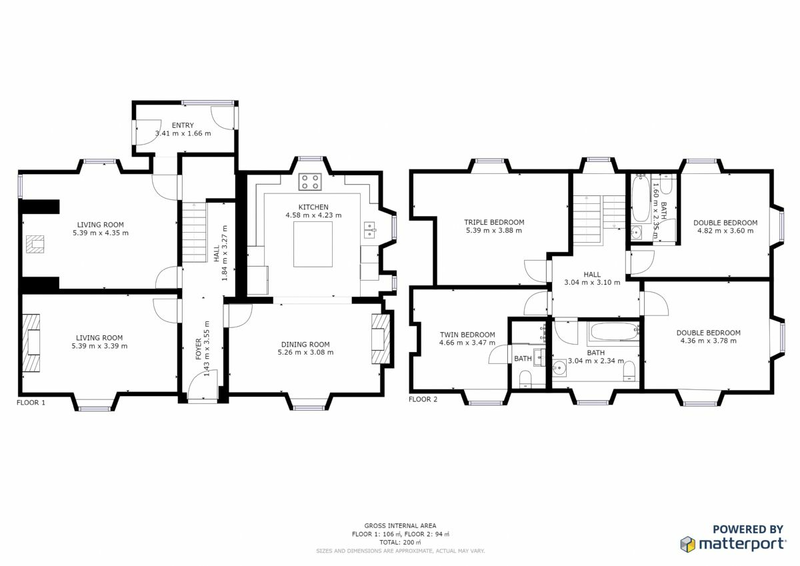 First Floor: Main bedroom with double bed and en suite Bathroom with bath, fitted shower, WC and wash-basin. Second bedroom with a 6' super kingsized bed and TV. Family bathroom with jacuzzi bath, fitted shower, WC and wash-basin. Twin bedroom with twin beds and en suite Bathroom with bath, fitted shower, WC and wash-basin. There is a fourth very sizeable family bedroom with either a 6' super kingsized bed or 2 3' single beds plus a further single bed. Annexe: The wheelchair accessible annexe offers a further bedroom with either a 6' super kingsized bed or 2 3' single beds and an ensuite wet-room. There is also a games room with pool table and TV. Exterior: There is a grassed garden, enclosed via stock fences and a Cornish dry stone wall so you might have to watch an escapee dog. A patio area with seating and a hot tub. There is a BBQ but you will need to provide your own charcoal. There is oil fired central heating throughout, heated towel rails in all bathrooms and a wood burning stove in the sitting room and the dining room. The kitchen has an electric hob, electric oven, microwave with grill, toaster, kettle, fridge/freezer, dishwasher, separate washing machine and drier. The sitting room and lounge both have separate TV and DVD systems and the lounge also has a sound bar and subwoofer system. WiFi is available throughout the property. There is an iron and ironing board. A travel cot & a highchair is available (please bring bedding for travel cot). Guest from Carshalton stayed for 4 nights. Guest from Plymouth stayed for 4 nights. Fantastic property plenty of space and excellent kitchen facilities... beds so comfortable and rooms spacious and clean. Annex was amazing and pool room a massive hit with all as was the hot tub... great food at the local pub and log burners great... first time away for a family Christmas ages from 12 to 73....totally recommend... only comment would be dressing table mirrors for hair drying and a double oven would have been better for a large family Xmas dinner although this wouldnt of been a problem any other time of the year. This was a wonderful house. Everything was clean and comfortable. It was more like a home than a holiday cottage. We thoroughly enjoyed our stay. My husband enjoyed the hot tub, I enjoyed the pool room and the dog enjoyed the local walks. A very relaxing stay. The house was just beautiful, large, luxurious, equipped to a high standard and had everything you could need and then more. With a wonderful welcome tray including tea, coffee, wine and biscuits, even milk in the fridge and fresh flowers set out. The bedrooms were airy, the beds large and comfortable. Two living rooms allowed for space and ease of living,most welcomed as there were ten of us. The kitchen was a dream, with a large island in the centre and a table that seated us all with ease, if in at nights all the girls were at the table chatting long after dinner had finished. Those two island seats were real favourites! The Annex was an unusual addition, roomy and bright with the ease of access if required. Whilst the pool room with TV was a real hit with many a fun game. The teenager would of stayed in here! Oh! and the hot tub...sheer bliss. The only disadvantage was the hare'em scare'em road up to the house from Porthallow village. But when you arrived and saw the house and that view, this was quickly forgotten. We even had 5 cars in the parking area. You could not beat sitting up in bed looking out onto the ocean to start the day, everything we wished for ...in a word "Stunning!" Guest from Guildford stayed for 14 nights. Review of Roskorwell Manor The property is well located as a base for days out. Porthallow is down the hill and is a steep ish walk but doable for most legs. There is a lovely pub there - the Five Pilchards - which is dog friendly and serves fantastic food. It is therefore very popular and small so do book. Fresh takeaway Pizza is available from a kiosk next to the pub - good Pizza. There is little else in Porthallow - it would perhaps benefit from somewhere to buy an ice cream. The beach itself is stoney and water is crystal clear. The kids enjoyed a dip and a few attempts at fishing off the rocks. Regarding Roskorwell Manor itself - the house is lovely - it has been restored very well and tastefully decorated, in keeping with the age/style of the property. We used just the main house as we didn't need the annex. It is situated next to other properties owned by the same company - these are more recently added/converted and more modern inside (our lovely holiday neighbours let us take a look!). The gardens around the property are nice - however it would take very little to make the garden secure to enable it to be more dog friendly - our dog made a couple of quick dashes through garden to next door's and also, of more concern, under the gate and into the road outside. The kitchen is well equipped and modern. However there were a few cupboards that smelt a bit damp and could do with some attention. Overall we felt that the housekeeping of this property was not up to the standard we would expect for the premium price paid. Some examples of this were that We did feel that the house wasn't particularly clean - examples of this were that drawers and cupboards were quite musty, the rug in the living room was smelly and dirty. We were on a two week holiday and the bedding was not changed once! We were only offered new towels after one week. We therefore washed our own sheets - where we discovered that the mattresses were quite old and dirty and therefore gave them a good vacuum ourselves before putting the sheets back on. The Hot Tub was not attended to regularly - at previous holiday properties it has been checked every 2/3 days. When we asked for it to be attended to (as it was going green) we were met with a response of 'well that happens with constant use'- we had used it only occasionally but even if we had used it all the time - it should be looked after properly. The couple who were 'housekeepers' were initially friendly but we found them to be quite grumpy and rude as the time went on. They had told us that they had experienced some nightmare situations with previous guests - we sympathised of course but did not feel that we deserved to be tarred with the same brush - we are a reasonably quiet and respectable family (my 79 year old dad, three middle aged adults and 4 children between 9-14). Other than these comments, we did have a lovely time and really enjoyed the area. Here are a few recommendations: We loved Coverack - a nearby small beach town where there is a fabulous paddleboard/kayak hire place in the harbour - so friendly and helpful. Coverack has a few places to eat / buy ice cream and a pub and dogs are allowed on the beach on leads. Kennack Sands is also great - it has a fairly easy to access dog friendly beach as well as two cafes at the main beach. Kynance Cove - lovely and incredibly picturesque but way too busy - it's a National Trust place. We walked down (a long way) to the beach - the beach was so packed that you were stepping over people to get through. It made the South of France look quiet! However on another day or out of season it would be a stunning place to go. The café there was amazing and we highly recommend the pasties! The café is dog friendly - the beach isn't. We did attempt to get to the 'dog friendly' beach but it was not feasible for us to climb down to it as the steps have eroded too much. Porthleven is also beautiful with it's little seaside town, great gift shops (no tacky nonsense) and stunning harbour. Great fudge too! We visited twice as we liked it so much. The beach there is not dog friendly but worth a visit if you are dog free. Poldhu Beach - great for surfing and our kids had a fab 2 hour lesson there at Dan Joel's surf school. The beach isn't dog friendly but the café is which is most helpful. It also has excellent food and seems to be managed very well - food is freshly cooked, fast and yummy (chips are stunning!). Be warned - the pasties are so popular that they sometimes run out! Well what can we say....this is the first time in 5 years of operation that we have had such negative comments and they will of course be investigated. As Owners it is imprudent and bad show to comment on individual guests. Guest from Sturminster Newton stayed for 7 nights. My family enjoyed every minute in this amazing house, it had everything we needed, it was very clean and warm, the welcome tray was very much appreciated, the only down side was the WiFi. We received no signal at all. We are delighted that you and your family had such a lovely stay at Roskorwell Manor House but sorry to hear about the lack of WiFi. The owner apologises for this but has confirmed that this temporary fault has since been fixed by BT and everything is now working satisfactorily.